Today’s Crankiness Crusher: Found Money! 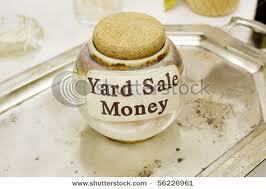 When we agreed to participate in my friend’s community yard sale, I never expected to make a decent amount of cold hard cash from it–but I was wrong! After clearing out our ridiculous collection of baby gear and other random paraphernalia like lamps (circa 1988) we inherited, an unusually excessive number of cutting boards, and enough toy trucks and cars to fill a small parking lot, we finally made a respectable pathway in our basement. I say “we”, but all I really did was give the thumbs up to what we were selling and then my husband turned into a wheeler and dealer while negotiating with customers. I’m TERRIBLE at naming a price and sticking to it, but Vlad stayed strong, showed people the item’s original value on Amazon (so they didn’t feel like they were getting ripped off), and then raked in some serious dough (if you consider $250 a lot–I do!). While it may seem annoying to sort through all of your stuff and haul it into your yard or to a friend’s house, it’s so worth it! Getting rid of things you don’t need is really cathartic and it also motivates you to clear out more. I plan on being much more organized for next year’s event. We’ll get some price stickers to display on our items, bring a clothing rack to show off our duds for sale–and we’ll sell cold drinks and food! Until then, I’m going to start putting things aside that I don’t need or use anymore (like costume jewelry, books I’ll never read again, clothes that don’t fit, etc). I love putting things into little piles, and knowing that they’ll eventually go to someone who actually wants them makes me feel good inside! Here’s hoping that you find a bit of happiness that you didn’t expect today!